MicroRNAs (miRNAs) are a class of small noncoding RNAs that perform important regulatory roles in plant growth and development. 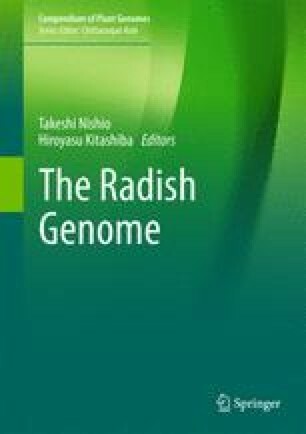 In this chapter, we introduced the miRNAs associated with radish tuberous root development at the whole genome level. Five small RNA (sRNA) libraries were constructed from roots of Asian big radish at different developmental stages. A total of 147.99 M clean reads were generated, from which 494 known miRNAs belonging to 434 families, and 220 putative novel miRNAs were obtained. Combined with target prediction and annotation, 77 (71 known and 6 novel miRNAs) differentially expressed miRNAs were potentially associated with tuberous root development. Target transcripts of these tuberous root associated miRNAs were involved in various biological processes, including development process, transcription factor regulation, plant hormone signaling, cell cycle regulation, and carbohydrate metabolism.